Oman Convention & Exhibition Centre (OCEC), the sultanate’s landmark business events hub located in Seeb area, is set to officially open its doors on Monday (October 10). Infra Oman 2016, the 6th edition of Oman’s International trade event for infrastructure and industrial projects, will be the opening event at the brand new facility. 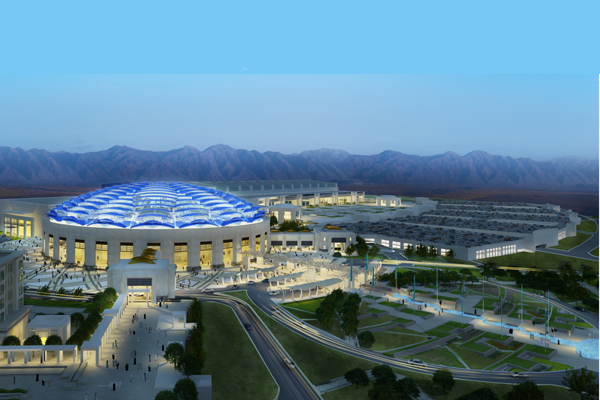 One of the region’s leading facilities for conferences and exhibitions, OCEC has been developed by Omran, a government-owned company mandated to drive the investment, growth and development of the tourism sector in Oman. Omran is the master developer of major tourism, heritage and urban developments in the sultanate. Located about 4 km from the Muscat International Airport, the new convention centre is part of Madinat Al Irfan Urban Development. It boasts two-tiered auditoriums that can seat 3,200 and 450 people, while the five exhibition halls will feature 22,000 sq m of column-free exhibition space. Designed to meet the demands of global conference organisers, are 19 meeting rooms, conveniently located on the second floor and easily accessible from the Theatre and Grand Ballroom, which offer 25-360 seats and overlook luscious landscapes, said the statement from Omran. Hall One will have a superior fit-out, specialised acoustic treatment, advanced lighting and rigging requirements to act as a multi-purpose space for plenary sessions, concerts, performances and gala dinners on a larger scale. Halls One and Two combined will seat up to 10,000 in theatre style, said the developer Omran. The centre will also include an additional 13 meeting rooms for 80 to 300 delegates, two well-appointed ballrooms to seat up to 2,590, 10 hospitality suites, a VIP pavilion, a spacious food-court and a multi-storey car park with a capacity for 4,000 vehicles. The precinct includes a five-star hotel linked to the convention centre, two four-star properties, a three-star hotel and apartments with a combined total of 1,000 rooms.